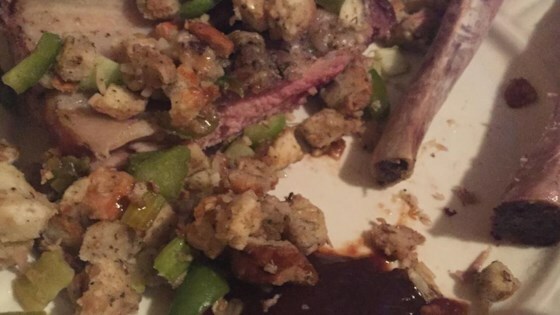 "My Mom made these when I was growing up, often after we had a turkey dinner and had leftover stuffing/dressing. They are delish!" Excellent way to make ribs....my mom's also done them this way for years. In a hurry, simply use a box of prepared stuffing,moistened with a little chicken broth. My family enjoyed this recipe but the next time I use this recipe I will brown the racks of ribs before stuffing them. Thank you so much for this recipe. I Smoked the ribs for three hrs at 220* then stuffed and tied. Then into a covered pan and into oven at 400* for 1-1/2 hr. It was great.